Discussion in 'iPad Accessories for iPAD 1, 2 and 3' started by weaselnoze, Aug 3, 2010. 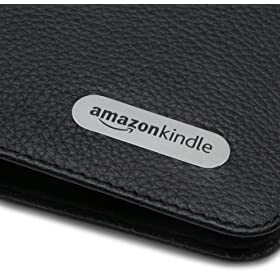 I am looking for a verrry simple leather case just like the Kindle comes with. One that doesnt go over the perimeter of the device. Basically I dont want to cover up the beautiful edges of the iPad yet still have it in a book-style cover. here is the kindle case.. But I'll recommend against it unless they changed the retaining straps. One of them straddles the on/off switch, another the microphone and the other, part of the speaker. Otherwise, I like it. 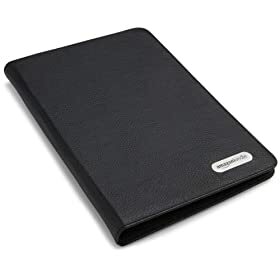 The Kindle case has hinges that attach directly to small hinge ports in the spine of the Kindle. A brilliant idea, IMHO. I *wish* Apple had given iPad a similar hinge system. Without that attachment mechanism, there's no way we'll see an iPad case as clean as the Kindle case; the case has to secure the iPad somehow... either with straps (ugly, I agree!) or something that surrounds the outer edge of the iPad. ..the case has to secure the iPad somehow... either with straps (ugly, I agree!) or something that surrounds the outer edge of the iPad. Not necessarily. My Yoobao V3 uses padded clips that leave the edges of the iPad and all connectors and controls free. now that case isn't bad, but i hate the straps. they look terrible. 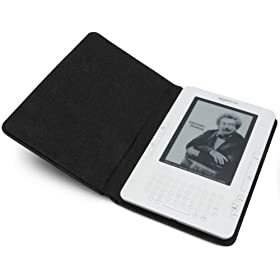 since the ipad doesnt have a 'hinge' like the kindle, i'd consider modding one of the available cases with velcro underneath and removing any 'straps' in lieu of the kindle hinge..
All of these have been discussed in this forum.